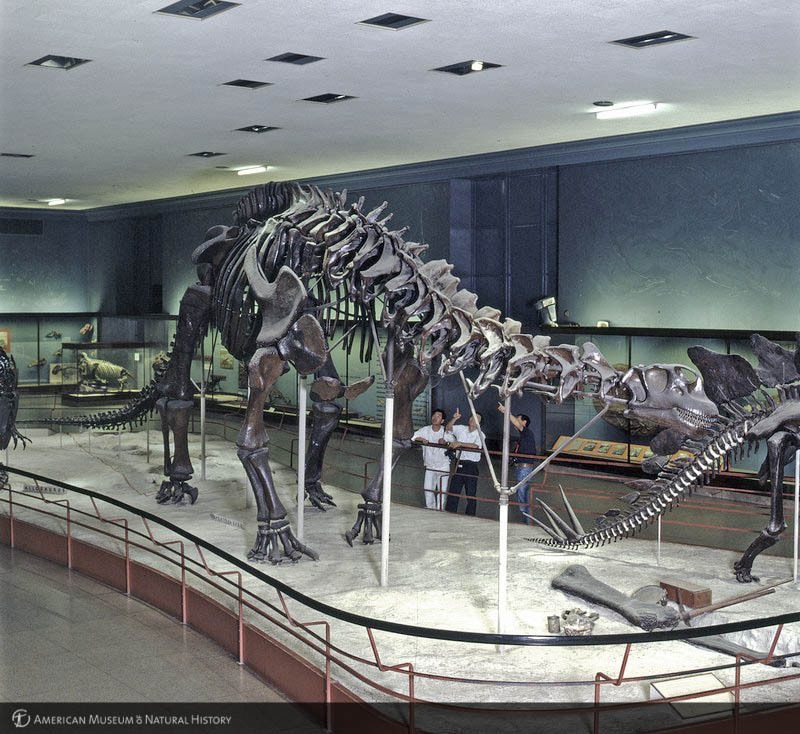 Start with History of the AMNH Fossil Halls – Part 1. During his leadership of the American Museum of Natural History’s Department of Vertebrate Paleontology and later, the museum at large, Henry Osborn oversaw an unprecedented expansion of the institution’s paleontology exhibits. As fossils poured in from the Department’s international collecting expeditions, these displays expanded into five separate galleries on the museum’s fourth floor. During the first two decades of the 20th century, AMNH staff was installing newly prepared and mounted specimens every single year, and AMNH was the undisputed center of American vertebrate paleontology. The increasingly marginal role of descriptive natural history in the greater field of biology at this time made the scale of Osborn’s program all the more impressive. Nevertheless, this golden age of fossil exhibits would not last forever. 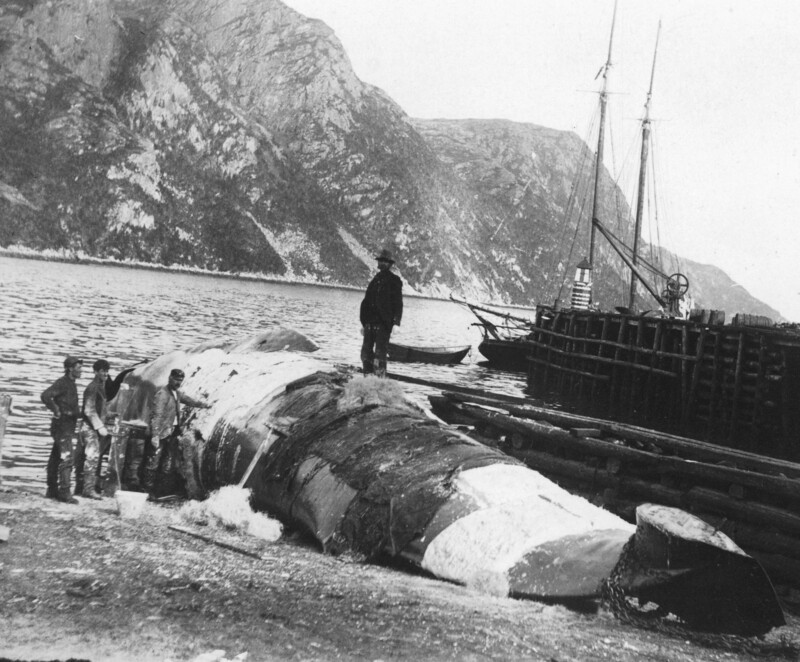 Osborn supported the expensive expeditions and monumental displays through his personal connections with wealthy benefactors. The combination of the Great Depression and Osborn’s death in 1933 all but eliminated this source of income, and the museum had to scale back its activities considerably. In 1942, the Department of Vertebrate Paleontology was dissolved. Paleontology work continued under the Department of Geology, but with only a fraction of its former staff and budget. In the post-Osborn era, responsibility for the fourth floor exhibits deservedly transferred to Barnum Brown. Indeed, Brown’s adventures as a swashbuckling fossil hunter not only brought him personal fame, but made the museum’s world-class paleontology exhibits what they were. 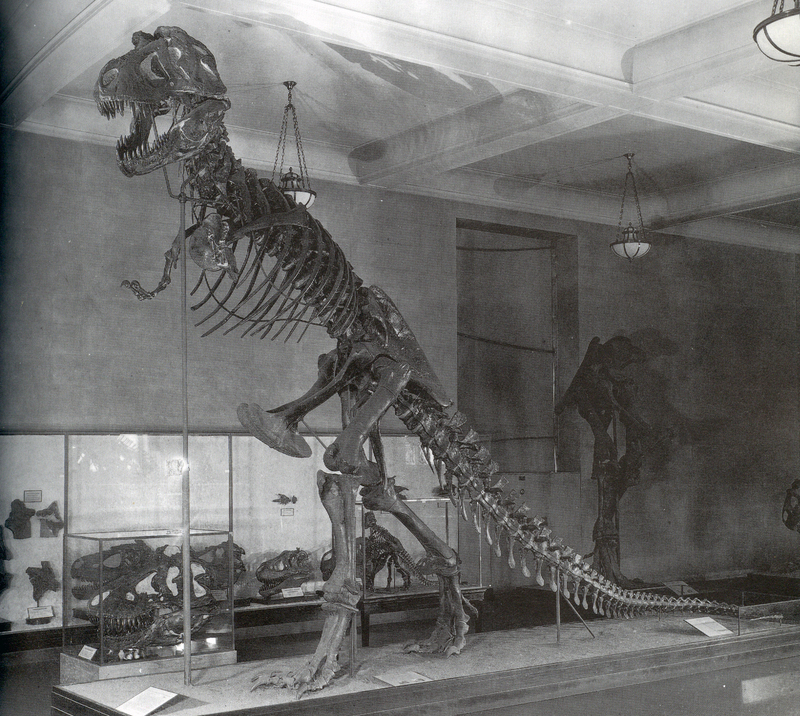 Of the 36 dinosaurs on display by 1939, no less than 27 had been discovered by Brown. 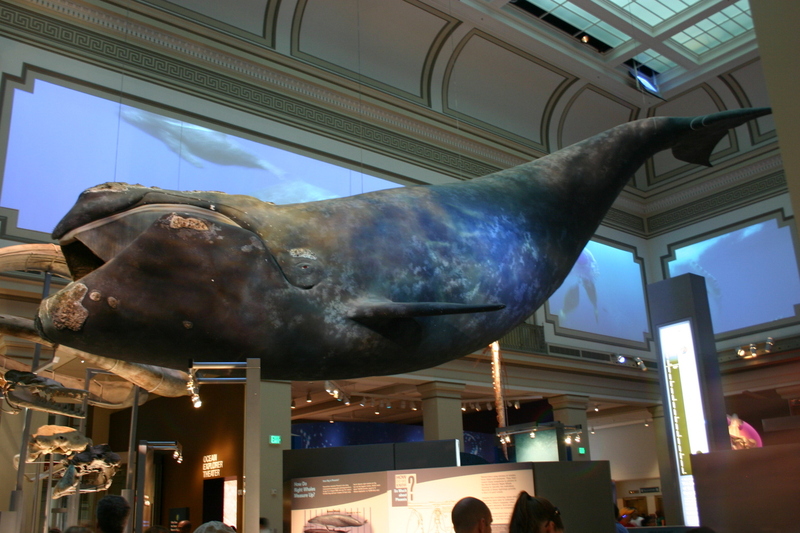 Most of these iconic finds were made in his 20s and 30s, but Brown nevertheless remained at AMNH for most of his life. Even after officially retiring in 1943, Brown still frequented the museum, often giving spontaneous personal tours of the exhibits. 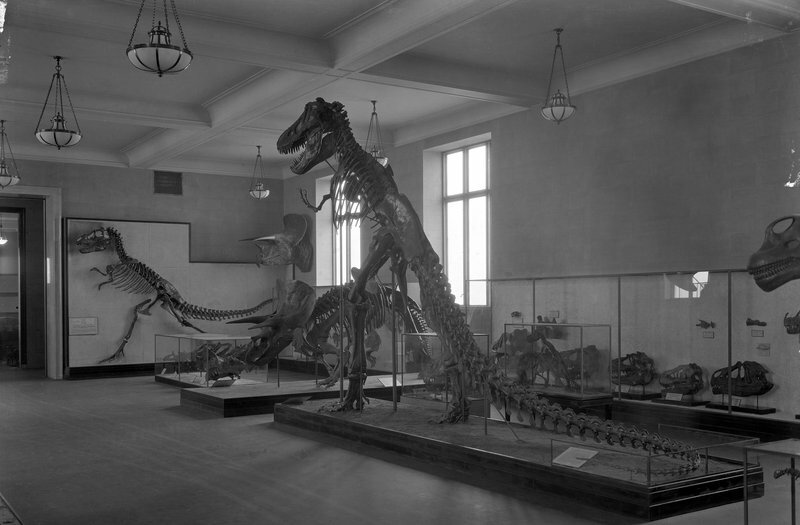 Brown’s Jurassic Hall, around 1940. Photo from Dingus 1996. In 1932, the architectural firm Trowbridge and Livingston completed the 13th building in the AMNH complex. This meant that for the first time, the paleontology exhibits formed a complete circuit, an arrangement that persists to this day. 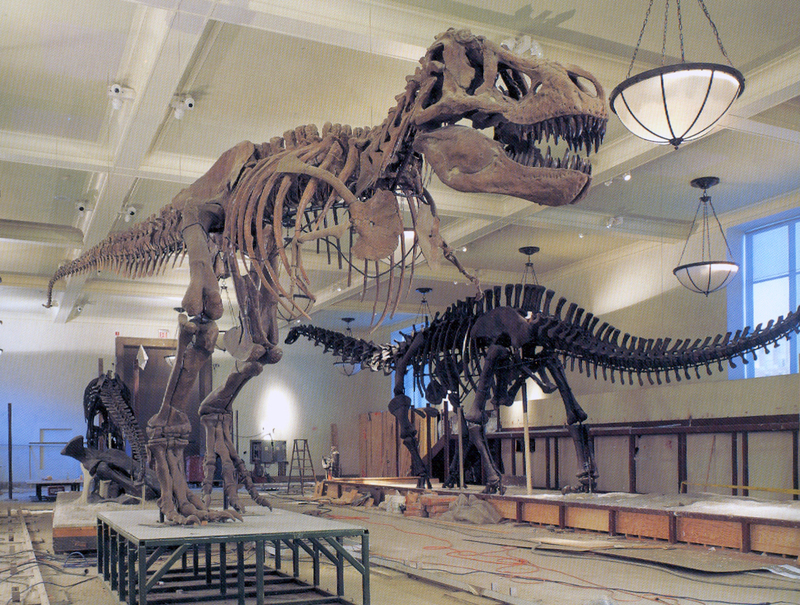 Brown opted to spread the dinosaurs into two halls, making the new space the Jurassic Hall and converting the Osborn-era Great Hall of Dinosaurs into the Cretaceous Hall. Several existing fossil mounts had to be moved as a result, including the massive “Brontosaurus.” Eyeballing the widths of the doorways and corridors separating the present day Hall of Saurischian Dinosaurs (formerly the Jurassic Hall) and Hall of Ornithiscian Dinosaurs (formerly the Cretaceous Hall and Great Hall of Dinosaurs), it’s difficult to imagine how museum staff could have moved the 66-foot sauropod in one piece. This photograph suggests that the skeleton was divided into several sections, which then had to be brought down the freight elevator on one side of museum and carted around to an elevator on the other side. 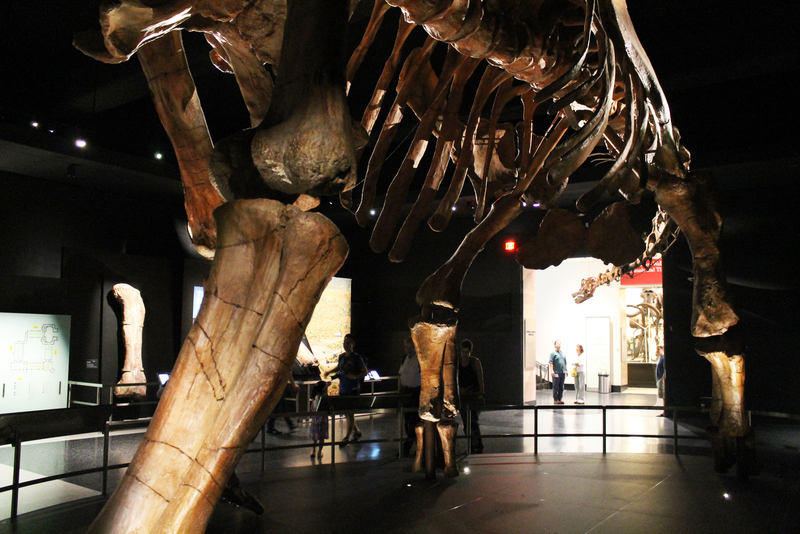 This would be the third and final position for the “Brontosaurus” – even when the mount was updated in 1995, preparators left the torso and legs in place. Brown’s Cretaceous Hall, around 1939. Photo courtesy of the AMNH Research Library. The 1930s and 40s saw a number of new dinosaur mounts added to the displays, nearly all of which were discovered by Brown. The new Jurassic Hall gained a Stegosaurus and Tenontosaurus (oddly, not a Jurassic dinosaur), and the Cretaceous Hall gained Brown’s astonishingly intact Centrosaurus, Corythosaurus, and Styracosaurus from Alberta. Edwin Colbert joined AMNH in 1930 as Osborn’s assistant (he called this “a time of experiences and incidents,” whatever that means). Eventually rising to Curator of Vertebrate Paleontology, Colbert was one of only a handful of mid-century researchers studying dinosaurs. He is also notable for his public outreach — in collaboration with his partner, Margaret Colbert, he wrote more than 20 popular books about paleontology. 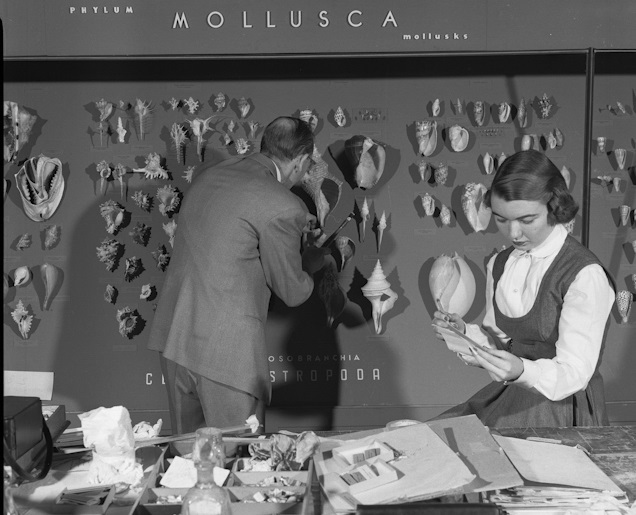 In 1953, Colbert worked with exhibit specialist Katharine Beneker to redesign the Jurassic and Cretaceous Halls. The Jurassic Hall received the most dramatic aesthetic makeover — windows were covered up to create a “black box” effect, while the dinosaur mounts were illuminated dramatically from above and below. The most significant addition to this space wasn’t a standing mount, but a trace fossil. Exhibit developers incorporated several slabs of sauropod tracks (collected at the Paluxy River in Texas by Roland T. Bird) into the central pedestal, as though left behind by the “Brontosaurus.” Cemented together, the slabs weighed 22 tons — apparently nobody expected that they would ever need to be moved. The fossil fish alcove, formerly part of the 1905 Hall of Fossil Reptiles, also found a home in this space. In stark contrast to the Charles Knight oil and watercolor murals commissioned by Osborn, Colbert elected to decorate the Jurassic Hall with a series of understated chalk drawings. Joseph Guerry created the illustrations, which was then projected onto the walls and traced in chalk. The initial plan was to paint over the chalk outlines, but Colbert enjoyed the blackboard-like look and left them as they were. The exhibit team didn’t even add fixative, since it would have turned the lines an unpleasant yellow. 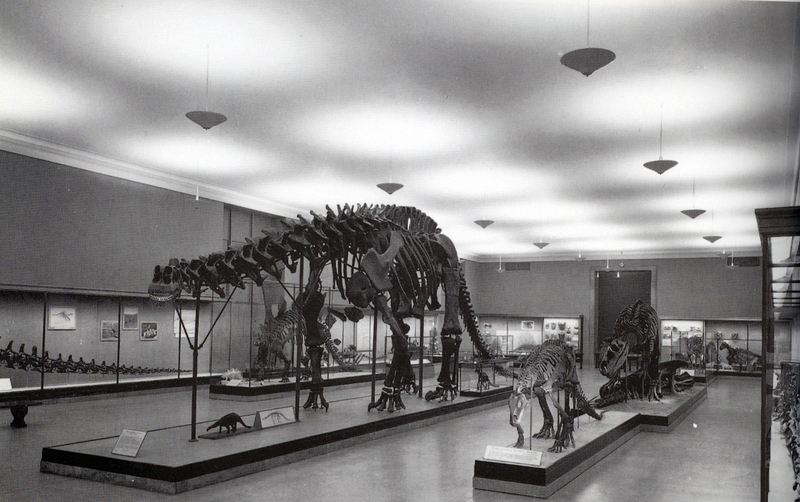 The Jurassic —or Brontosaur— Hall opened in 1953. Photo from Dingus 1996. Architectural modifications to the Cretaceous Hall were minimal, although the standing dinosaur mounts were all clustered onto a single platform. Interestingly, both the National Museum of Natural History and the Peabody Museum of Natural History would arrange their dinosaurs in precisely the same way within the decade. 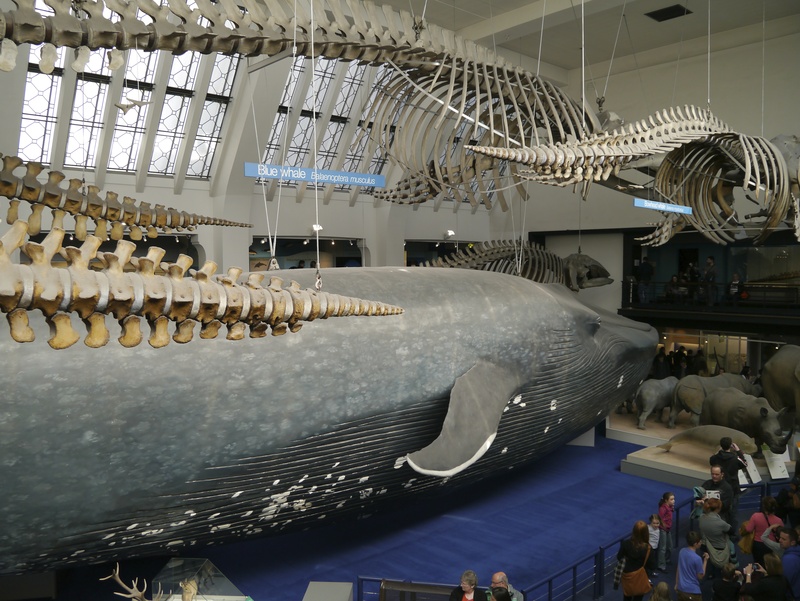 While it’s possible that these museums were copying AMNH, this similarity is probably a reflection of the transition to more holistic natural history displays that was occurring in museums nationwide. Rather than displaying specimens individually, exhibit designers in the 1950s and 60s began to arrange them in meaningful ways — for example, grouping animals with a shared habitat. The Cretaceous Hall also gained some new specimens, including an array of Protoceratops skulls recovered during the Central Asiatic Expeditions. Signs and labels were updated with more approachable language, once again reflecting contemporary museum theory. The Cretaceous —or Tyrannosaur— Hall opened in 1954. 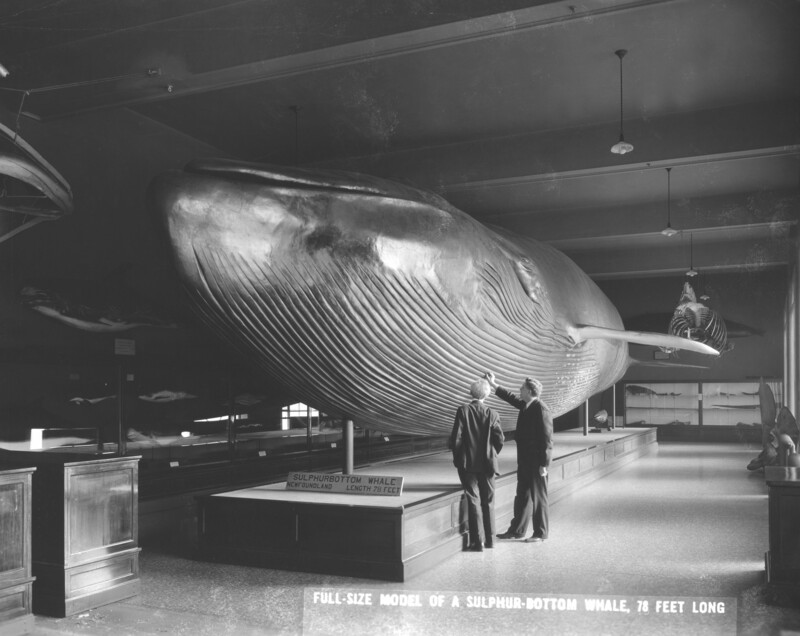 Photo courtesy of the AMNH Research Library. 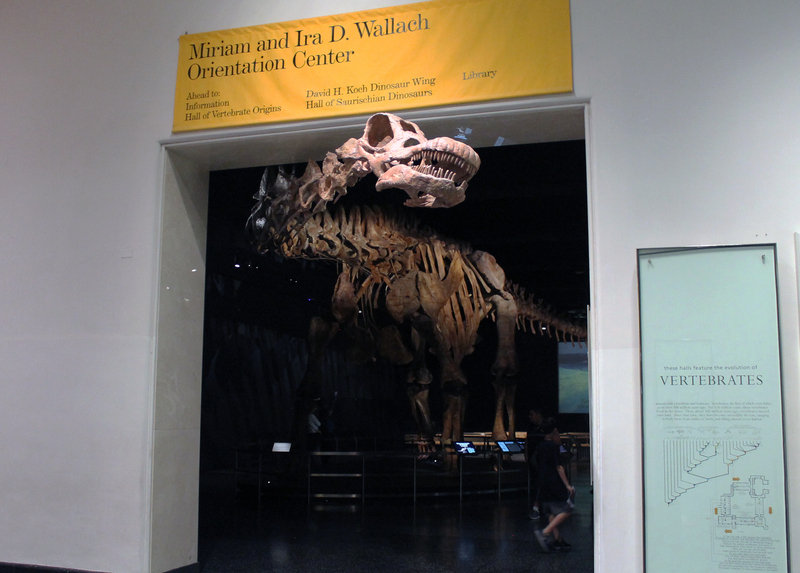 Meanwhile, some of the oldest AMNH fossil exhibits were retired and replaced during this period. In 1961, the classic geology hall — the oldest exhibit on the fourth floor — became the research library and was closed to regular museum visitors. 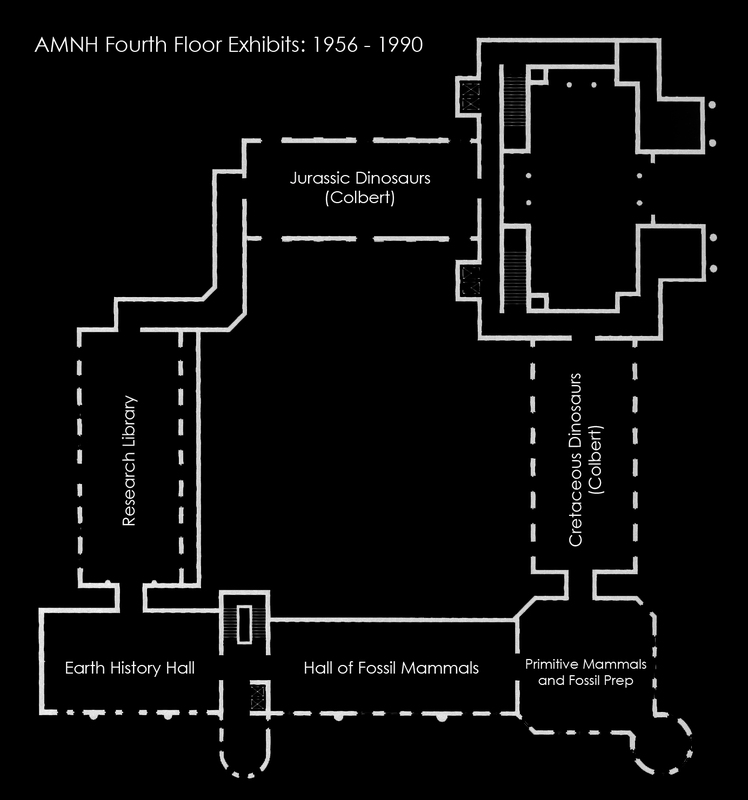 Its spiritual successor was the new Earth History exhibit, which replaced Osborn’s Hall of the Age of Man. Around the same time, George Gaylord Simpson curated what was colloquially known as the “Sloth Hall.” Occupying the space that was once the Hall of Fossil Reptiles, this exhibit featured ground sloths and glyptodonts, plus a sizable display demonstrating how fossils are collected and prepared. 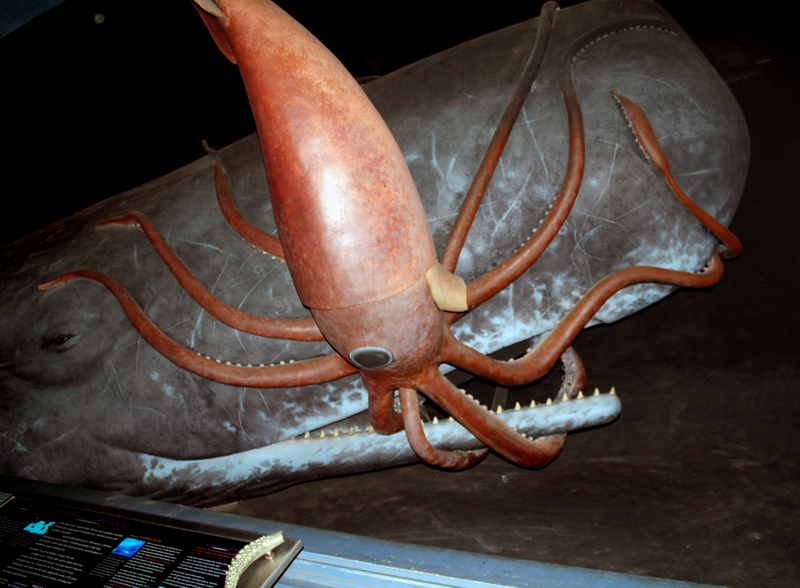 Only the Hall of Fossil Mammals remained ostensibly untouched during this wave of modernization. 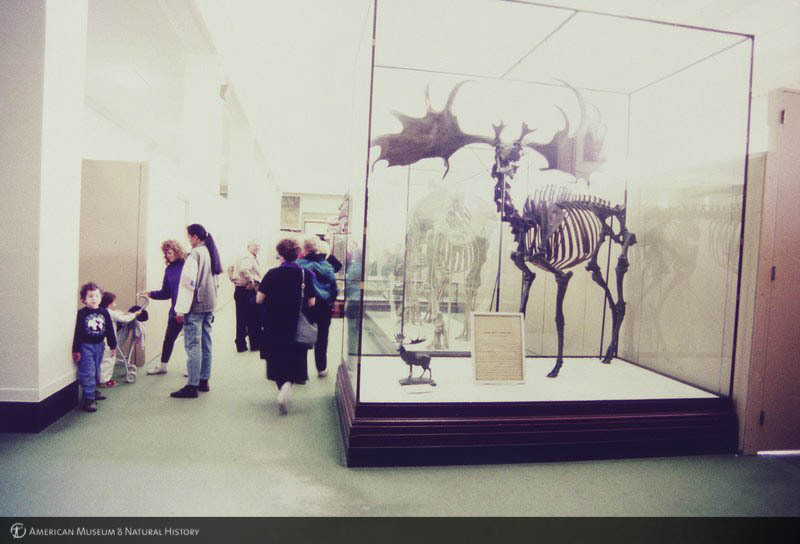 The Hall of Advanced Mammals in 1982. Some sections were boarded up but remaining exhibits were virtually unchanged from the turn of the century. Photo courtesy of the AMNH Research Library. 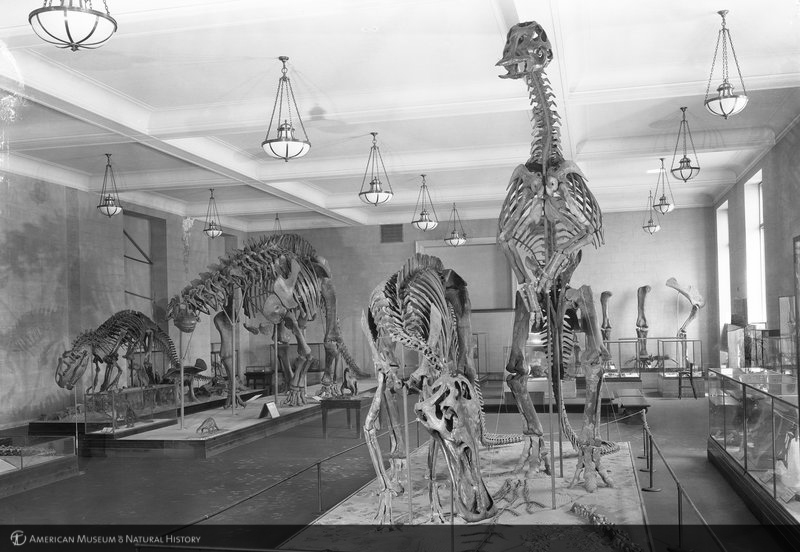 The 1950s and 60s iterations of the AMNH fossil halls endured for 30 years, making them the longest-lasting versions to date. Displays like the “Brontosaurus” and Tyrannosaurus became immutable symbols for the institution, visited again and again by generations of museum-goers. However, time gradually took its toll. A large section of the Hall of Fossil Mammals was boarded up, since museum staff had removed so many specimens for study or conservation. Railings were eventually added to the Jurassic Hall, because it was too tempting for visitors to join the dinosaurs on the platform, Ke$ha-style. The Brontosaur Hall in 1988. Photo courtesy of the AMNH Research Library. Most importantly, the exhibit content became increasingly out-of-date with each passing year. This obsolescence permeated nearly every aspect of the exhibits, from the discussion of the dinosaurs’ extinction to the drab, earth-tone aesthetics. However, the most visibly antiquated elements were the fossil mounts themselves. A new wave of dinosaur research demonstrated that these animals had been active and socially sophisticated, a far cry from the the coldblooded tail-draggers that populated the galleries. AMNH had once been the center of American paleontology, but by the late 1980s its dated displays were lagging far behind newer museums. 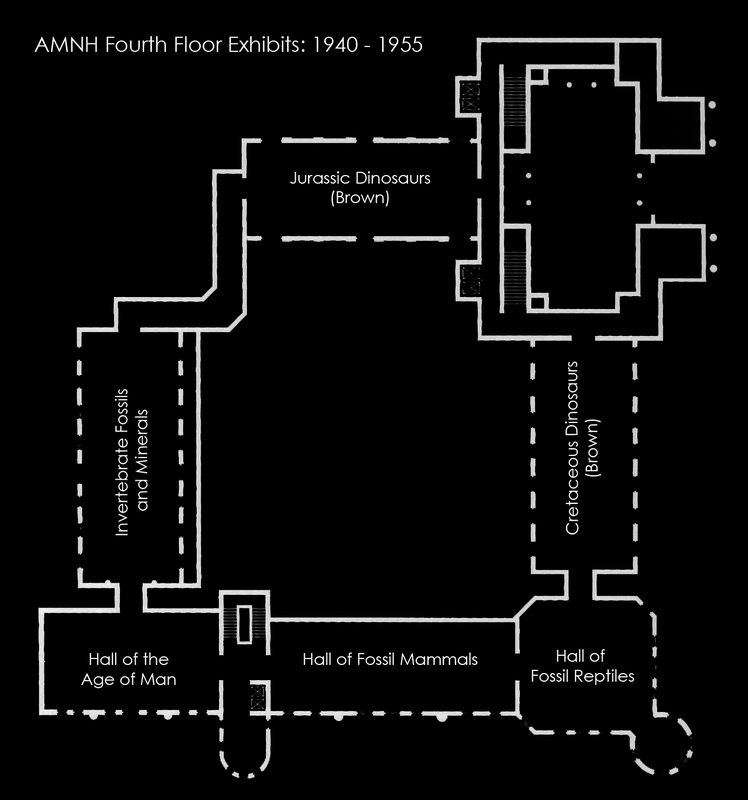 Between 1987 and 1995, Lowell Dingus coordinated a comprehensive, $44 million renovation of the AMNH fossil exhibits (previously discussed here and here). 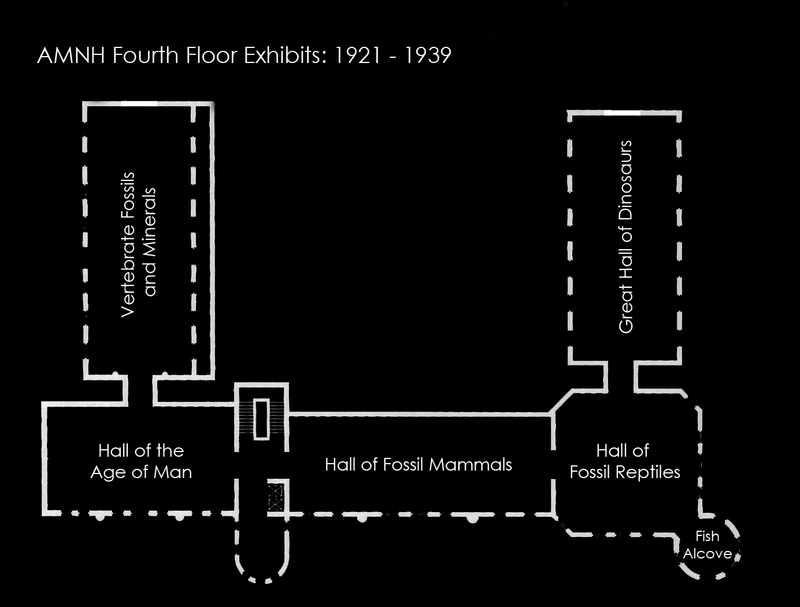 The original plan was to renovate only the Hall of Fossil Mammals, since it had remained largely unaltered since 1895. Within a year, however, the project had expanded to encompass all six halls on the fourth floor, telling the entire story of vertebrate evolution. Two primary goals originated very early in the planning process. First, the “walk through time” layout would be replaced with one rooted in phylogenetic classification. 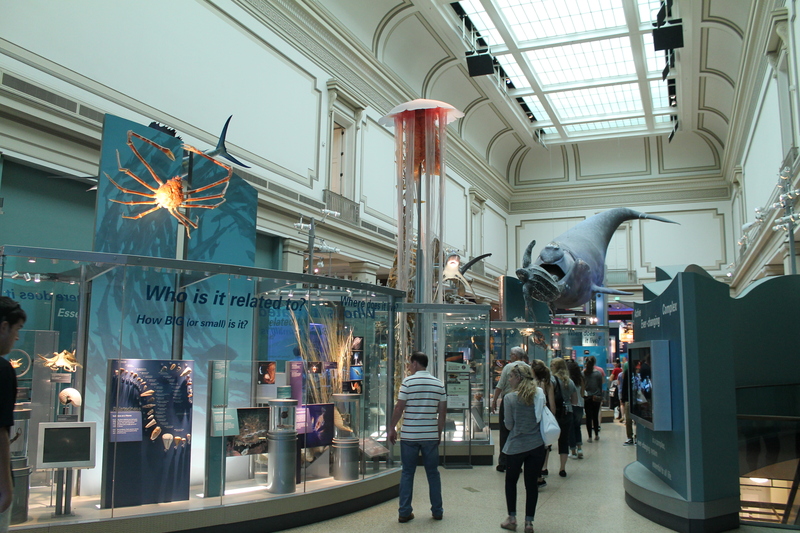 The cladistic methodology for tracing organisms’ evolutionary history became the central theme that unified the new exhibits. This required a fairly substantial reorganization of existing specimens. The mammals could remain in the same two halls, but the denizens of the Jurassic and Cretaceous halls had to be rearranged to feature Saurischian and Ornithiscian dinosaurs, respectively. Meanwhile, the research library moved to a new location to make way for the Hall of Vertebrate Origins. 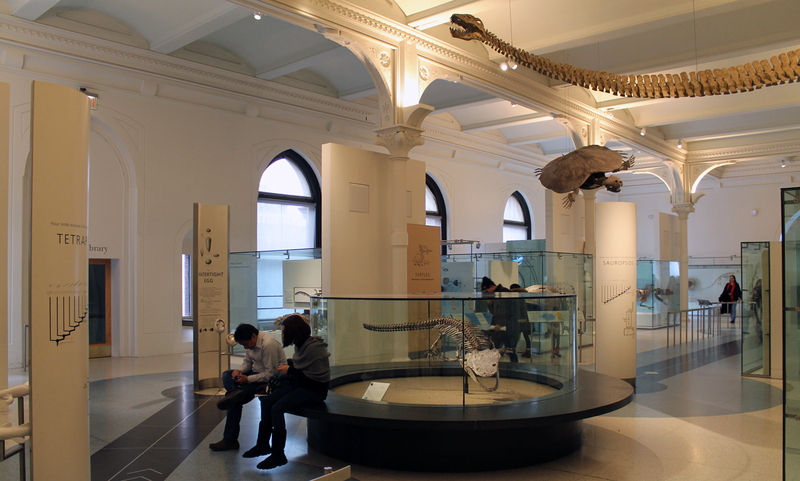 The Hall of Advanced Mammals was the first renovated exhibit opened to the public. Photo by the author. The second major goal was to restore the original architecture in each hall, ensuring that both the historic specimens and the spaces they occupied would come “as close to their original grandeur as possible” (Dingus 2006). In many cases original architecture elements — such as the molded ceilings — were still intact behind panels that had been installed over them. These features were painstakingly restored, or when necessary, recreated. Classic decorative elements, from the colonnades to the elegant chandeliers, were reintroduced. 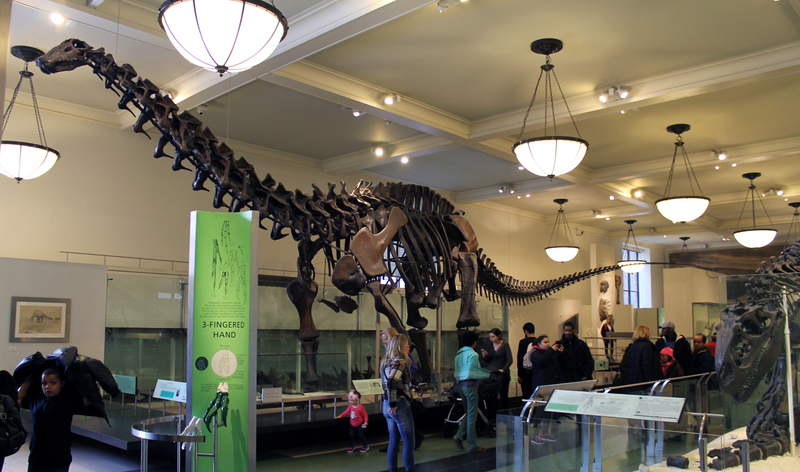 The updated Apatosaurus in the Hall of Saurischian Dinosaurs. Photo by the author. The vast majority of the fossil mounts in the renovated exhibits had already been on display for years. Among the classic mounts, only the two most iconic displays were completely overhauled. The restoration of Apatosaurus (formerly “Brontosaurus“) took more than a year. A conservation team led by Jeanne Kelly worked from a temporary wooden scaffold, filling cracks in the aging fossils with epoxy and securing loose joints on the armature. 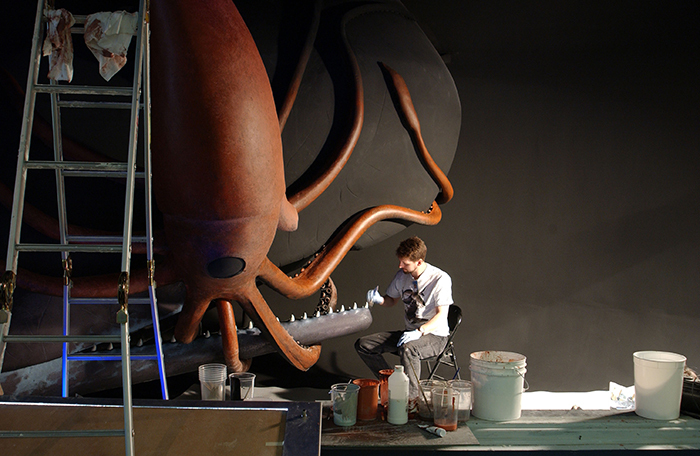 The mount’s torso and legs remained in place throughout the process, but the neck and tail were dismantled and remounted by Phil Fraley’s exhibit company. In addition to a new head, the revised Apatosaurus gained several caudal and cervical vertebrae, extending its total length to 88 feet. Remounting the Tyrannosaurus rex was even more difficult, because the fossils were so fragile. Once again, Phil Fraley was responsible for disassembling and reposing the skeleton. The T. rex now sports a more accurate horizontal posture, and its weight is supported by steel cables extending from the ceiling. The new fossil mounts are easily recognized by their dynamic poses. In the Hall of Vertebrate Origins, the amphibian “Buettneria” (now Koskinonodon) assumes a diving pose, while a Prestosuchus charges with its tail aloft. Among the dinosaurs, a new Deinonychus mount (assembled in part from previously-unidentified historic material) is posed in mid-leap. Finally, the dog-like Amphicyon chases the tiny antelope Ramoceros in the Hall of Advanced Mammals. In the Hall of Vertebrate Origins, a new Koskinodon mount represents the vertebrates’ critical transition to terrestrial life. Photo by the author. The AMNH fossil halls represent one of the most exhaustively complete fossil collections in the world, but these exhibits ultimately tell two stories. On one hand, we have the story represented by the fossils themselves. The exhibit is an extended genealogy, tracing our origins across 500 million years of deep time. On the other hand, we have the museum’s history, which highlights both the praiseworthy and the ugly sides of 20th century science. It reminds us where our society has been and where it needs to go. Both stories are relevant to each and every person passing through these halls, and laudably, the latest renovation highlights both. Colbert, E.H. (1958). Chalk Murals. Curator 4:10-16. Norell, M, Gaffney, E, and Dingus, L. (1995). Discovering Dinosaurs in the American Museum of Natural History. New York, NY: Alfred A. Knopf, Inc.
Much of what I write for this site starts with an attempt to find one reference or another, only to discover that it does not exist online. This time, I was curious how many times the American Museum of Natural History paleontology halls had been renovated, but I quickly found that there was no simple answer. 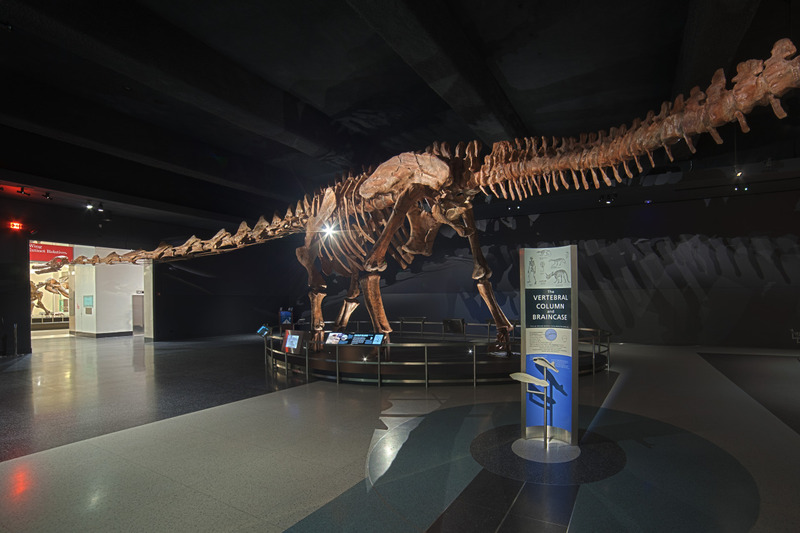 Unlike the fossil exhibits at the National Museum of Natural History, which have occupied the same large hall since the building opened, the AMNH counterparts have been moving and growing for more than 120 years. The museum expanded organically, eventually encompassing 27 interconnected buildings. And as its footprint grew, the paleontology exhibits grew with it. The following is my attempt to make sense of the fourth floor exhibit halls’ convoluted history. I’ve divided it into six phases, although this should only be considered a rudimentary outline. Many specimens were added and removed during each phase, particularly during the period of frantic expansion in the early 20th century. At the very least, however, this should be enough to contextualize most of the historic photos made available by the AMNH Research Library. As with my NMNH posts, please note that I will not be discussing field expeditions or scientific discoveries by museum staff, as these topics are well-explored elsewhere. My focus here is solely on the public-facing exhibits, and the people who created them. 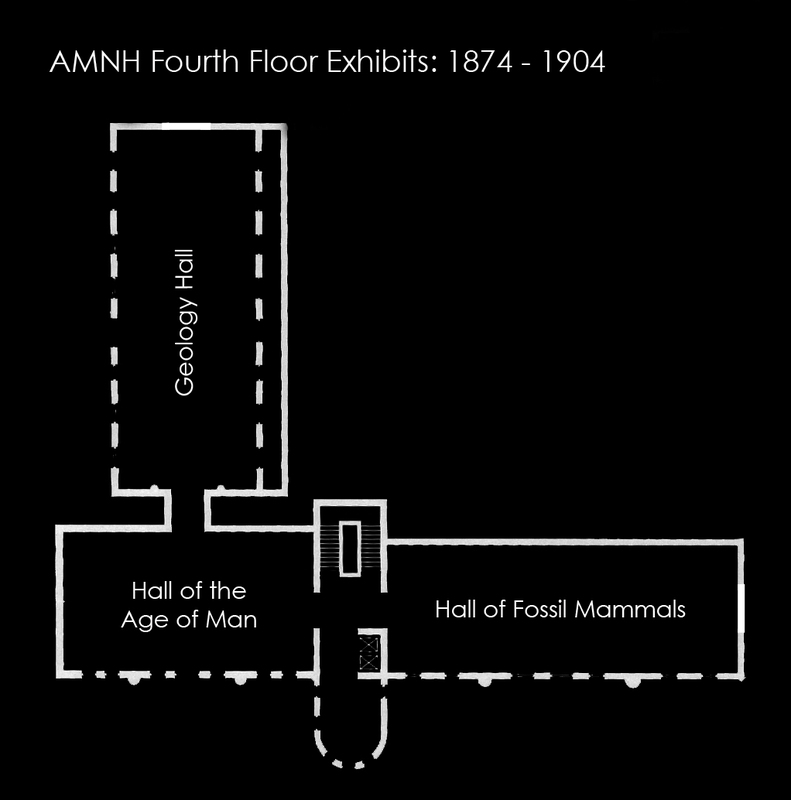 AMNH was founded in 1869, although the first buildings in Manhattan Square did not begin construction until 1874. The original structure was designed by architect Calvert Vaux. Since electric lights were not yet available, Vaux created exhibit spaces that maximized the impact of natural lighting. Large windows were divided into slits that paralleled rows of glass display cabinets. The sun would shine through the windows and directly into the cabinets, illuminating the specimens within. 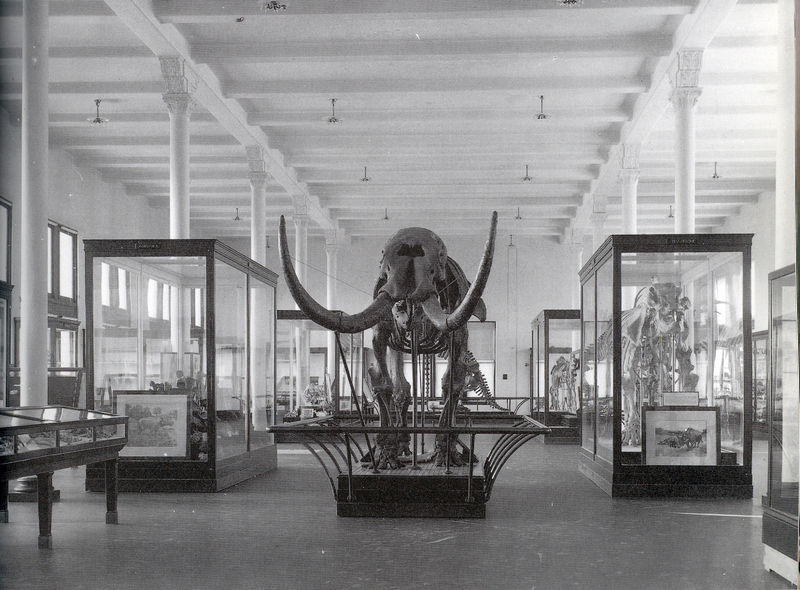 When the museum first opened, the single exhibit hall on the fourth floor was dedicated to geology specimens. While this space mostly housed rocks, minerals, and small fossils, a handful of mounted skeletons stood among the cabinets. Early acquisitions included a moa and the Pleistocene deer Megaloceros, shown below. Geology Hall, before 1887. Photo from Dingus 1996. Things changed radically shortly after Henry Osborn was hired in 1891. As a paleontologist, Osborn emerged from Princeton riding the crest of a wave of goodwill his discipline had enjoyed for most of the 19th century. Paleontology was the darling of American science, and one man in particular, O.C. Marsh of Yale, received generous federal funding to find and describe new fossils from the western interior. In the 1880s, however, an economy-minded Congress pulled that funding. Meanwhile, the rise of experimental biology led to the marginalization of descriptive natural history, including paleontology. The next generation of paleontologists needed a new home for their work, and they found it in museums. 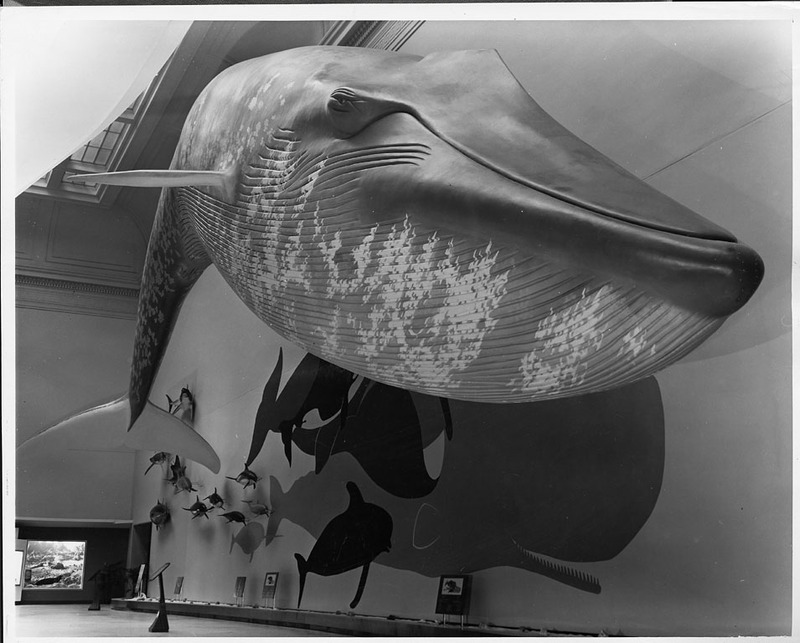 AMNH was one of several new museums backed by wealthy benefactors with an interest in public education. 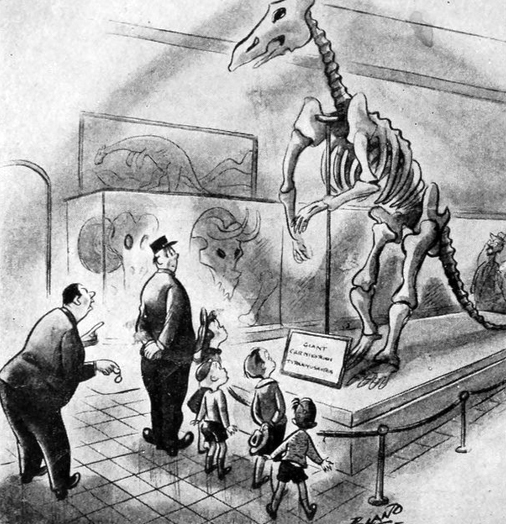 These benefactors gravitated toward paleontology because, as Ronald Rainger put it, fossils are “rare, valuable, and visible.” The skeletons of extinct monsters were huge and sensational, and naturally complimented the grandiose neoclassical halls of the nascent museums. But while the paleontology programs at institutions like the Carnegie Museum and the Field Museum were quite respectable, they all were overshadowed by Osborn’s Department of Vertebrate Paleontology at AMNH. Osborn’s goal was to make AMNH the center of American vertebrate paleontology in the post-Marsh world, and by most any measure he succeeded. 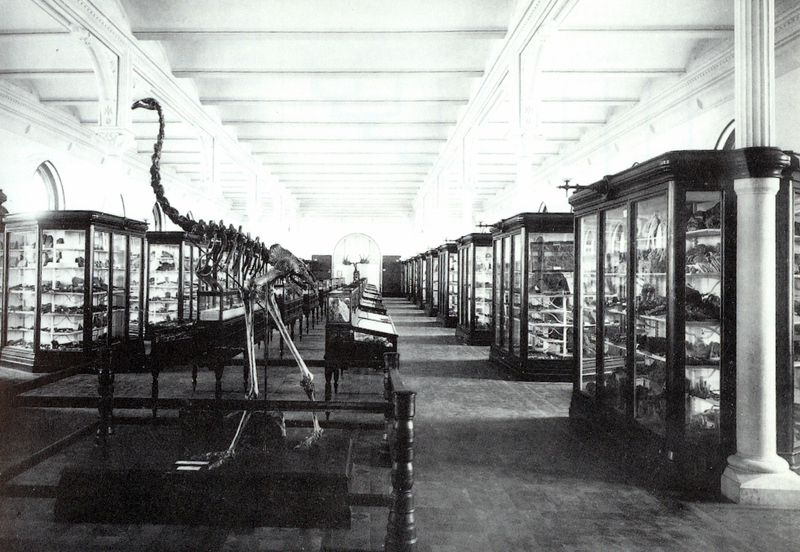 Hall of Fossil Mammals, around 1906. Photo from Dingus 1996. 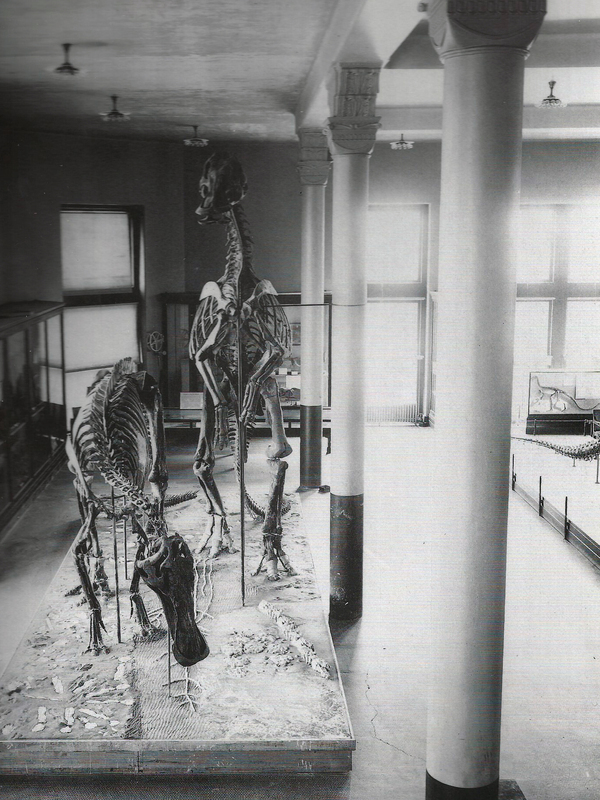 The next Phase I exhibit was the Hall of Fossil Mammals, which opened to the public in 1895. Osborn’s research was focused on Cenozoic mammals, especially brontotheres, and he tasked his department with assembling a suitably impressive collection. Some of the fossils on display were acquired in an 1897 purchase of Edward Cope’s personal collection. Many others were collected by AMNH staff in the Big Horn Basin of Wyoming. Among these in-house finds was the famous (and famously misleading) series of fossil horses, most of which were found and prepared by William Matthew. The largest and most captivating mounted skeleton on view was the Warren mastodon. Discovered in 1845 in a bog near Newburgh, New York, this specimen was the first complete mastodon ever found. 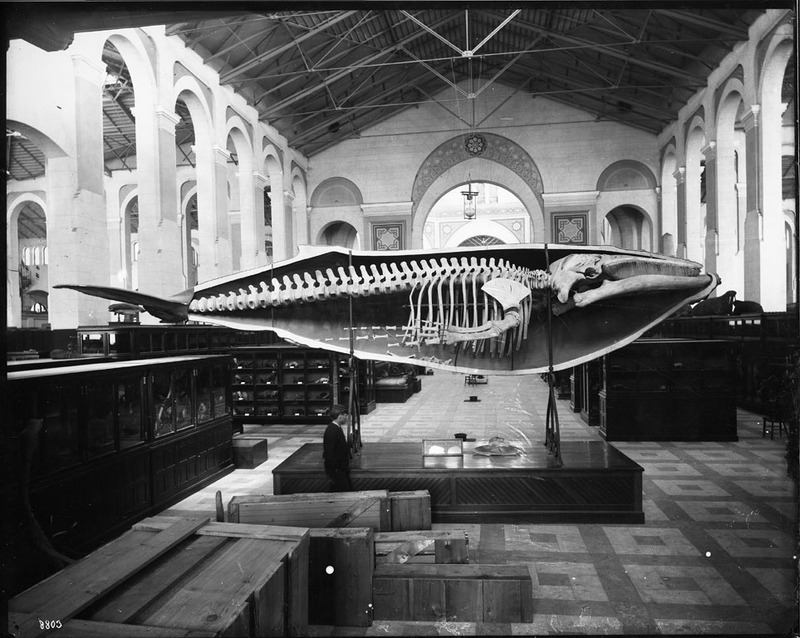 It was initially described and displayed by Boston-based anatomist John Warren, but Osborn convinced J.P. Morgan to buy it for AMNH in 1906. 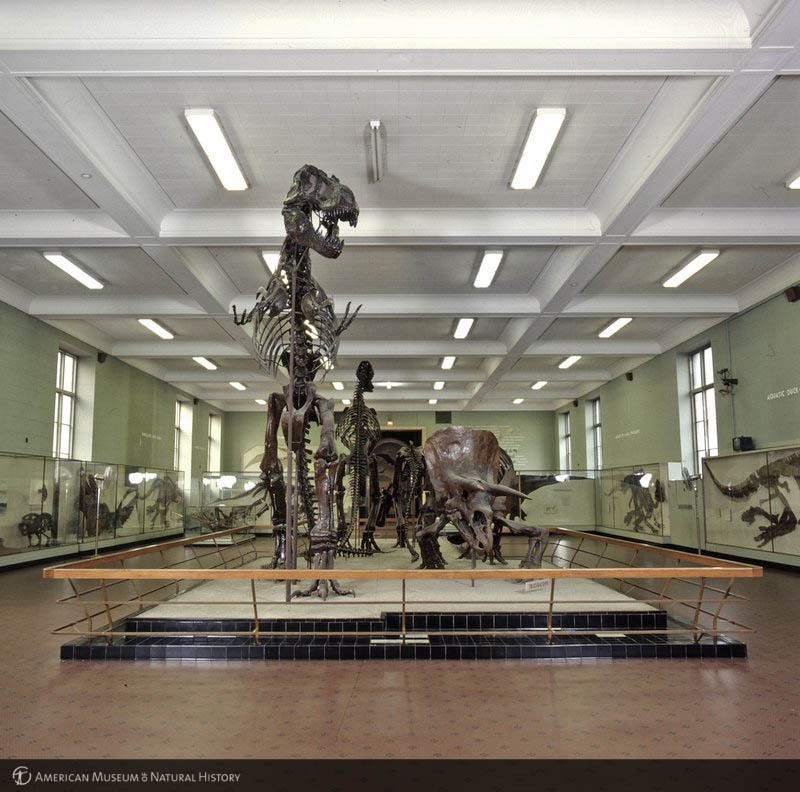 Aside from a few shuffled mounts (including the aforementioned mastodon, which seems to have been in nearly every room on the fourth floor), the Hall of Fossil Mammals remained mostly intact for the duration of the 20th century. Shortly after it was completed, the Department of Vertebrate Paleontology shifted its focus to dinosaurs. The mammals were only the star attractions for a few short years, but this display would nevertheless endure in its original form for generations. “Ancestry of Man” case in the Hall of the Age of Man, 1929. Photo courtesy of the AMNH Research Library. At this point, it is crucial to mention that Osborn was an objectively lousy scientist, and that much of his work was motivated by a bigoted personal agenda. He subscribed to an inaccurate orthogenetic (or as he called it, “aristogenetic”) interpretation of evolution, professing that all life forms had their place in a natural hierarchy. According to Osborn, people of Anglo-Saxon and Scandinavian ancestry were the pinnacle of existence, and he endeavored to turn his flagrantly racist beliefs into public knowledge by way of his exhibits. Nowhere is this clearer than the Hall of the Age of Man, which opened around 1900. 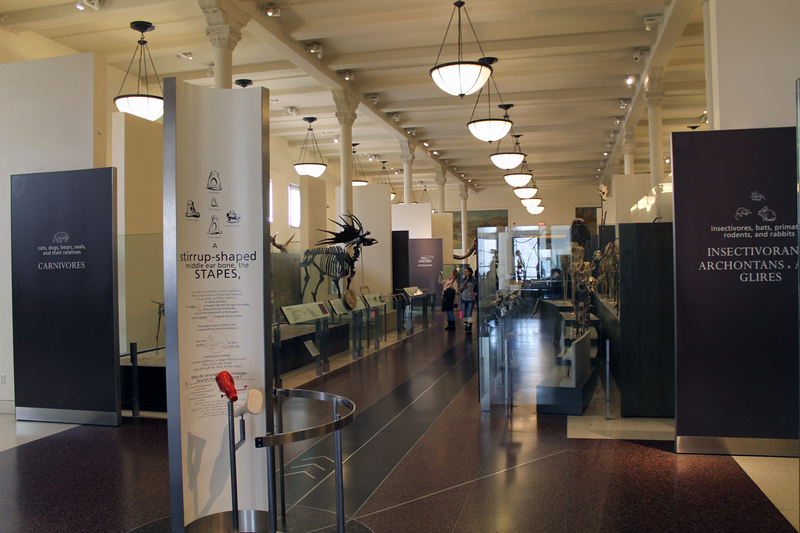 This hall included a range of extinct animals that coexisted with early humans, but the central cases were dedicated to Osborn’s unorthodox narrative of human evolution. Hominid fossils were co-opted to illustrate Osborn’s unfounded view that modern human races were evolutionarily distinct, and to communicate his support for eugenics and racial purity. Osborn’s agenda was supported by many of the aristocratic elite that funded the museum, but apparently few of the AMNH research staff endorsed it. Margaret Mead in particular was highly critical of Osborn’s views, and especially his influence over public-facing interpretation. For all of Osborn’s bigotry and bad science, it’s difficult to imagine the modern museum field without his influence. He was very good at marketing himself and his paleontology program, and he knew how to put on a show that would attract visitors in droves. 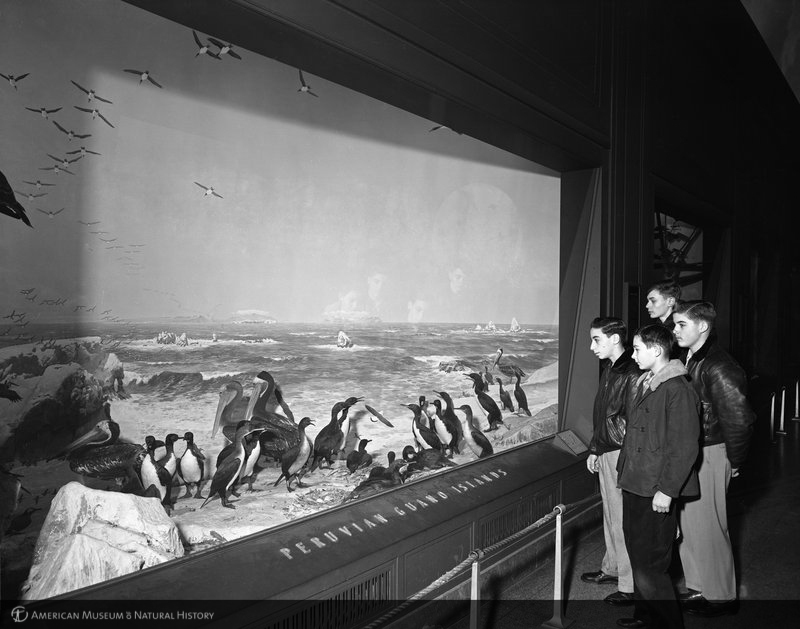 Osborn heightened the standards for public exhibitions, investing in lifelike habitat dioramas of taxidermy animals and spectacular fossil mounts in order to make science exciting for a wide audience. 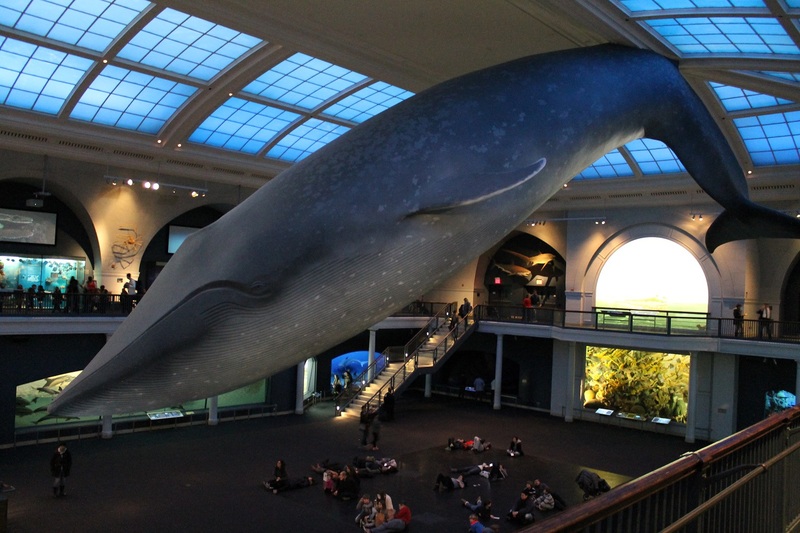 Osborn’s devotion to storytelling and drama in the exhibits he curated brought millions of visitors to AMNH and defined public expectations for what museums should offer. In 1906, Osborn became the fourth president of AMNH, and he oversaw its most rapid period of expansion. As president, he tripled municipal funding for the museum from New York City, and gained plenty more through his connections with wealthy potential donors. Much of this income was funneled into the Department of Vertebrate Paleontology’s famous dinosaur collecting expeditions, in which fossil hunters like Barnum Brown and Walter Granger earned fame and notoriety. However, the pioneering work on fossil preparation and mounting at AMNH was also significant. 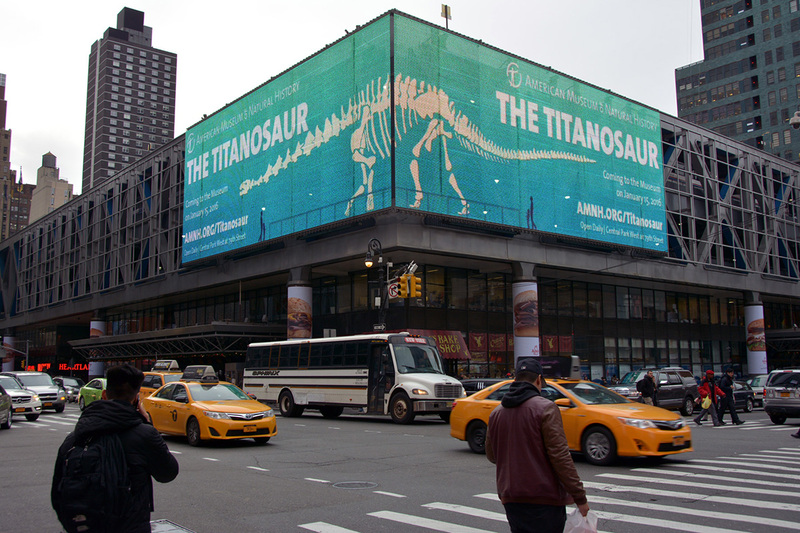 While many peer institutions were assembling and exhibiting new dinosaur mounts during this period, none matched the output or ambition of AMNH. With the sheer quantity of fossils coming in and institutional pressure to mount them for display as quickly as possible, chief preparator Adam Hermann had no choice but to modernize and professionalize his craft. Hermann developed a sophisticated prep lab with overhead tracks for hoisting heavy fossils, as well as electric and pnuematic hook-ups for power tools. Techniques like sand-blasting, acid preparation, and on-site metalworking developed by Hermann are still standard practice today. “Trachodon” pair in the Hall of Fossil Reptiles. Photo from Dingus 1996. Dinosaurs take up a lot of space, and to accommodate them, a new gallery was opened on the far end of the Hall of Fossil Mammals. 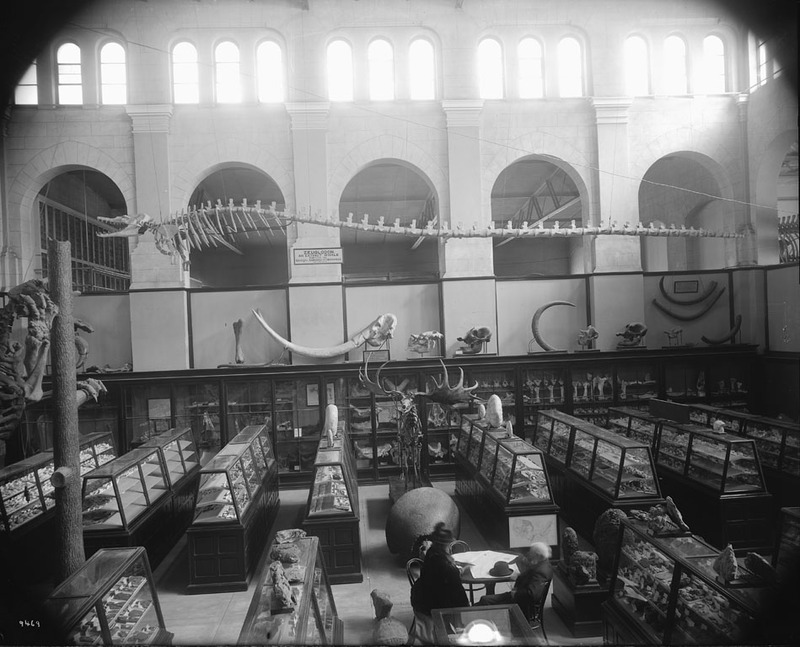 This Hall of Fossil Reptiles debuted in 1905 with “Brontosaurus” – the first mounted sauropod ever built – as its centerpiece. 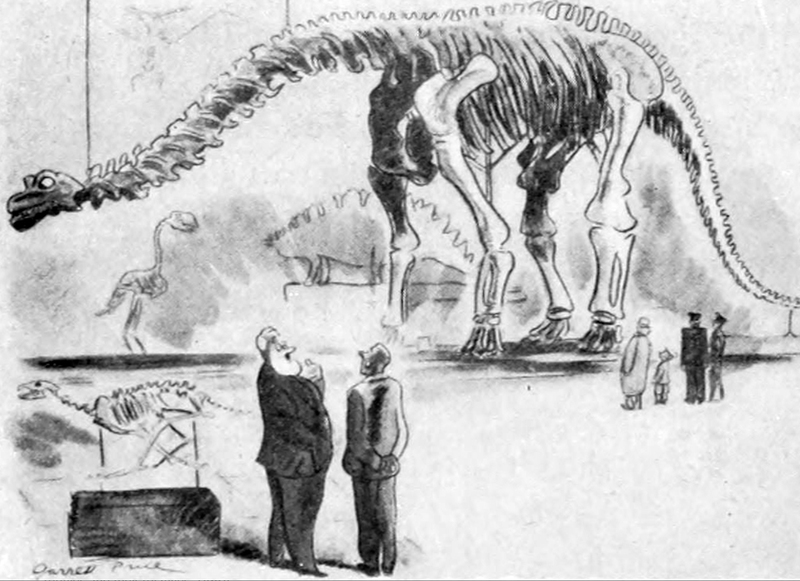 Actually a composite of four individuals and many sculpted elements (including the way-off-the-mark head), the “Brontosaurus” took Hermann’s team the better part of six years to construct. After that, the Hall of Fossil Reptiles filled with new dinosaur mounts very quickly, cementing the repuation of AMNH as the place to see dinosaurs. In 1906, Hermann added the “Trachodon” pair. The standing individual came from the Cope collection, but the crouching specimen was excavated that very year by Barnum Brown. The Allosaurus was also a Cope specimen, but apparently the 19th century paleontologist had never unpacked or inspected it. Several years passed before Hermann’s team discovered that the skeleton was remarkably complete, although it was missing a skull. The Allosaurus fossils were mounted in 1908, posed as though feeding on a set of Apatosaurus vertebrae. Tyrannosaurus stands with Allosaurus and “Brontosaurus” in the increasingly crowded Hall of Fossil Reptiles. Photo from Dingus 1996. Arguably the most important mount added during the early 20th century mounting spree was the Tyrannosaurus rex. This specimen is no less than an icon, and has been a destination attraction in New York for longer than the Empire State Building. When the Tyrannosaurus was unveiled in 1915, it was a sensation, akin to mythical dragon made real. 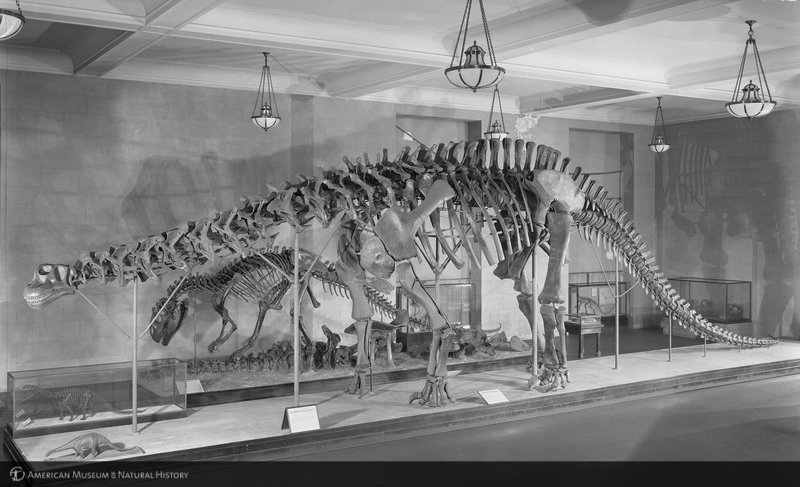 For a generation, AMNH was the only place in the world where visitors could stand in the presence of a T. rex, and to this day the image of the classic mount is quintessential to both paleontology and museums in general. For example, you may recognize it from the cover of a certain Michael Crichton novel. 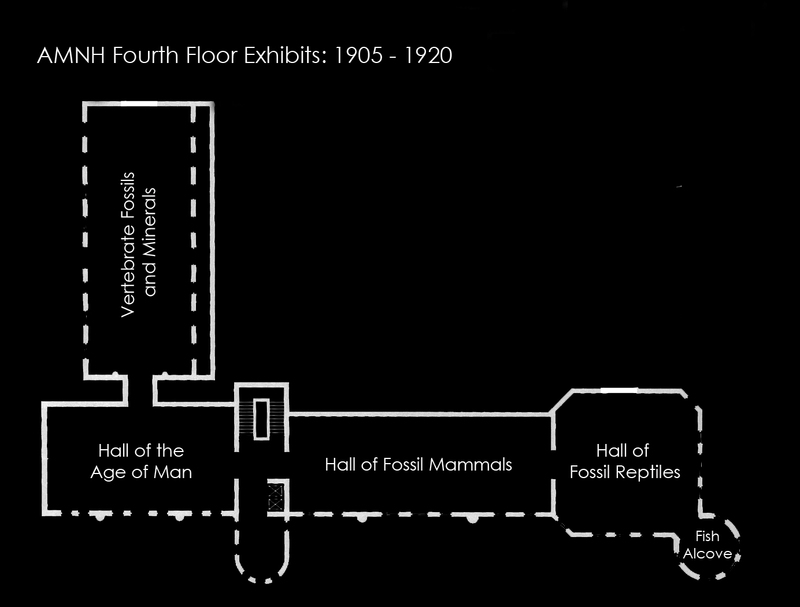 In 1922, the 9th building in the AMNH complex was completed, and the paleontology exhibits expanded into what Osborn called the “Great Hall of Dinosaurs.” The largest dinosaur mounts – including Tyrannosaurus, “Brontosaurus”, “Trachodon”, and Allosaurus – were moved from the comparatively cramped Hall of Fossil Reptiles into this new space. The extra breathing room allowed for the mounts to be clustered into Jurassic and Cretaceous areas on opposite sides of the room. There were also a few new skeletons, including Leptoceratops, Thescelosaurus, and most significantly, Triceratops. 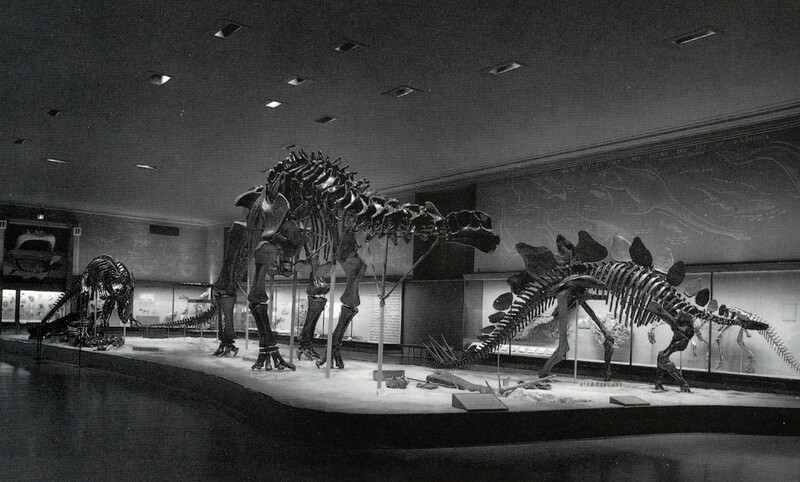 “Brontosaurus” in the Great Dinosaur Hall, around 1927. Photo courtesy of the AMNH Research Library. Meanwhile, AMNH fossil collecting efforts had moved from the American West to Mongolia. The primary goal of Roy Chapman Andrews’ Central Asiatic Expeditions was to find evidence for Osborn’s pseudoscientific ideas about human ancestry, but no such remains were found. Instead, the expedition returned a wealth of new dinosaur fossils, including the first dinosaur nests ever found. Dispatches from the field also drummed up considerable publicity for the New York museum. 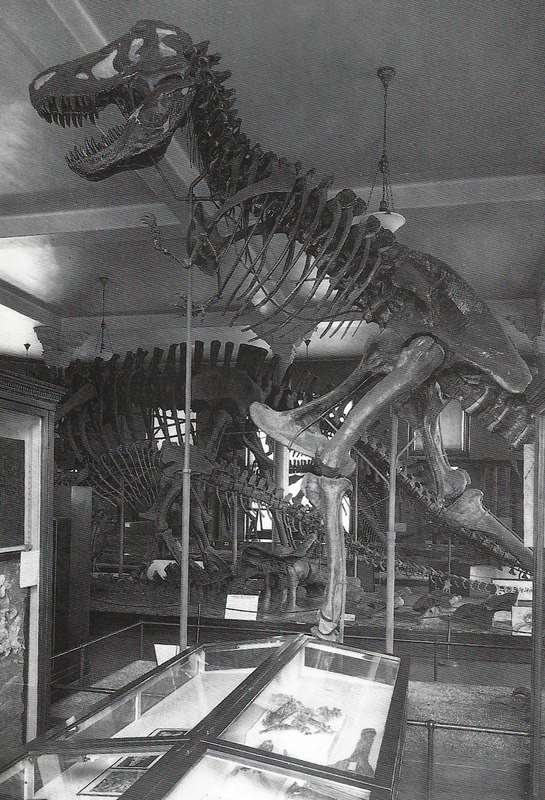 Tyrannosaurus and Triceratops in the Great Dinosaur Hall, around 1927. Photo courtesy of the AMNH Research Library. Osborn’s iron-fisted reign over American paleontology lasted until his death in 1933. Unfortunately for the Department of Vertebrate Paleontology, Osborn’s activities depended heavily on personal relationships with private donors. With Osborn out of the picture (and the Great Depression at its bottom), those donations dried up. Meanwhile, Osborn’s good standing in the scientific community had begun to wane, and his unorthodox anthropological ideas became something of a joke. The results of internal investigations into Osborn’s less-than-legitimate use of funds and favors during his time as president did not help matters. In 1942 the Department of Vertebrate Paleontology was dissolved. Paleontology work was folded into the Department of Geology with a much smaller budget and fewer staff. 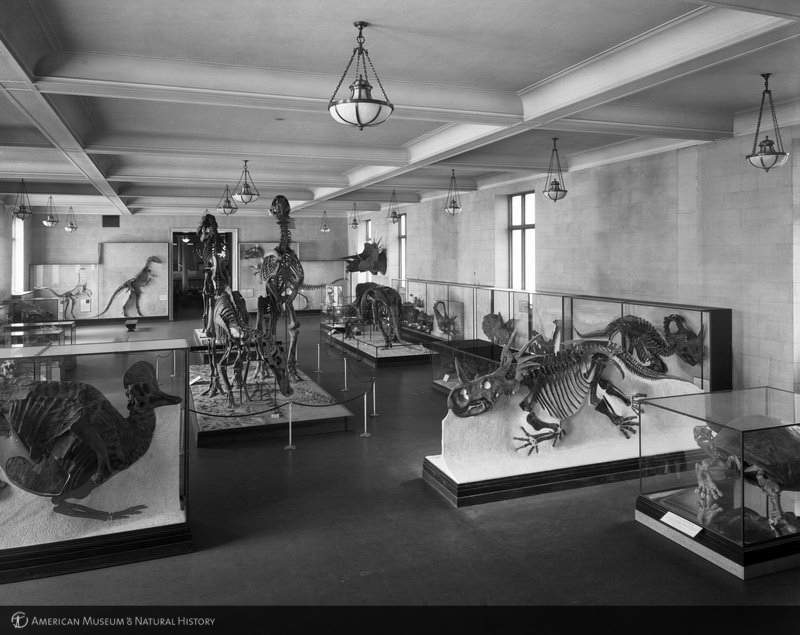 The Osborn-era fossil displays at AMNH remained largely unaltered in the years that followed, but only because of the lack of staff time, money, and interest. Next week, we’ll wrap up this timeline, passing through the era of Edwin Colbert and into the present day. Stay tuned! Brinkman, P.D. (2009). 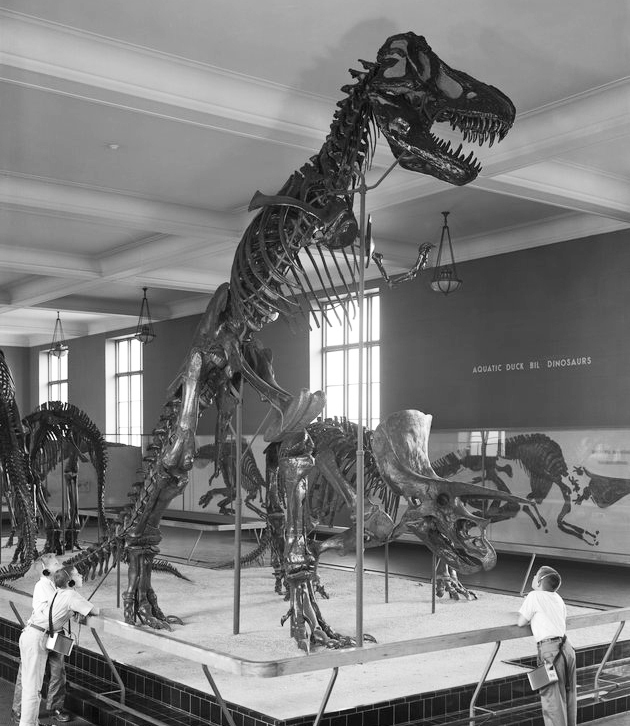 Dinosaurs, Museums, and the Modernization of American Fossil Preparation at the Turn of the 20th Century. Fossil Preparation: Proceedings of the First Annual Fossil Preparation and Collections Symposium 21-34. Brinkman, P.D. (2010). The Second Jurassic Dinosaur Rush: Museums and Paleontology in America at the Turn of the 20th Century. Chicago, IL: The University of Chicago Press. Haraway, D. (1984). Teddy Bear Patriarchy: Taxidermy in the Garden of Eden, New York City, 1908-1936. Social Text 11:20-64. Hermann, A. (1909). Modern Laboratory Methods in Vertebrate Paleontology. Bulletin of the American Museum of Natural History 56:283-331. Osborn, H.F. (1921). The Hall of the Age of Man in the American Museum. Nature 107:236-240. Rainger, R. (1991). 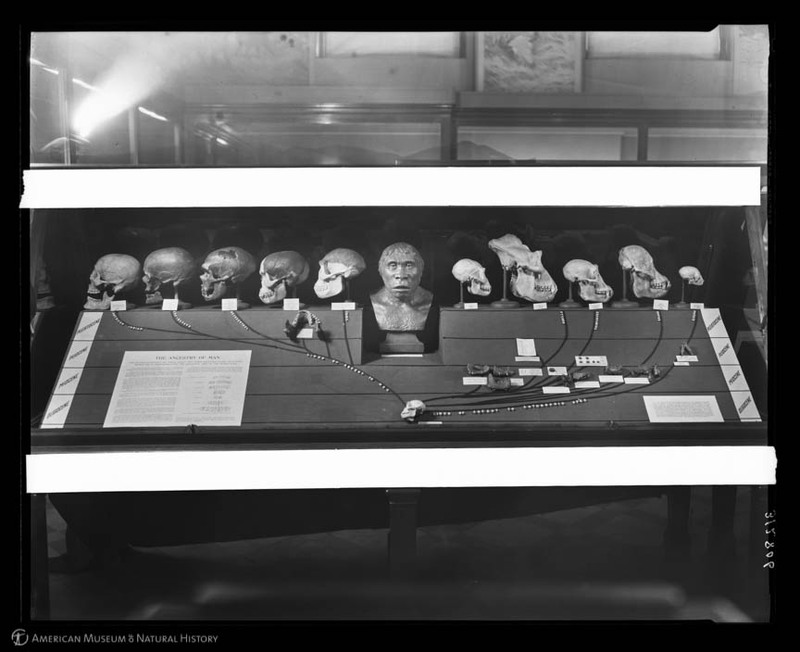 An Agenda for Antiquity: Henry Fairfield Osborn and Vertebrate Paleontology at the American Museum of Natural History, 1890-1935. Tuscaloosa, AL: The University of Alabama Press.